The soybean (Glycine max) is a species of legume native to East Asia, widely grown for its edible bean which has numerous uses. 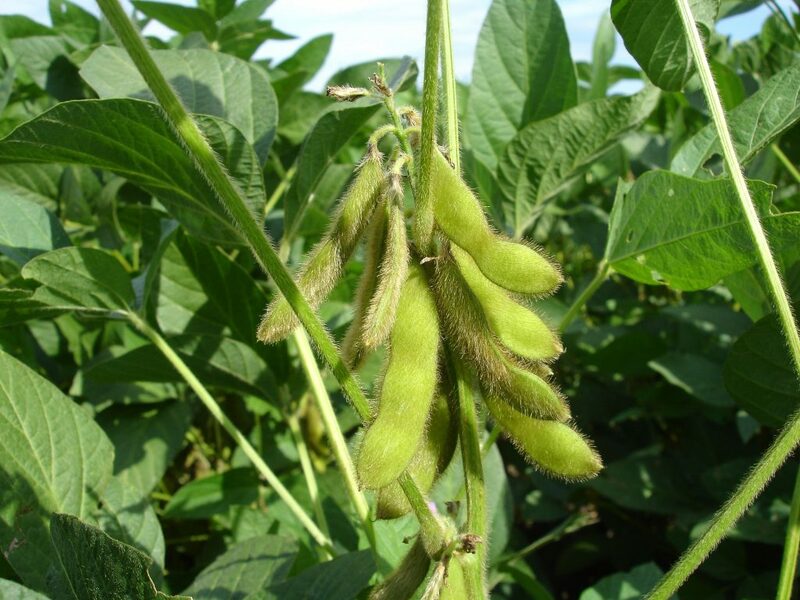 Soybeans are classed as an oilseed rather than a pulse due to their high oil content (protein at 40% and oil at 20%). Soybean plants are a small annual, summer-growing bush that can vary in height from 0.2-2m. Cultivated varieties generally grow to about 1m. The pods, stems and leaves of the plant are covered in fine brown or grey hairs. The leaves have 3–4 leaflets per leaf, which are 6–15cm long and 2–7cm wide. The flowers are small and self-fertile and can be white, pink or purple. The plant sheds the leaves when the seeds are mature. The fruit of the plant (the pod) grows in clusters of three to five, is 3–8cm long and usually contains two to four (rarely more) seeds that are around 5–11mm in diameter. 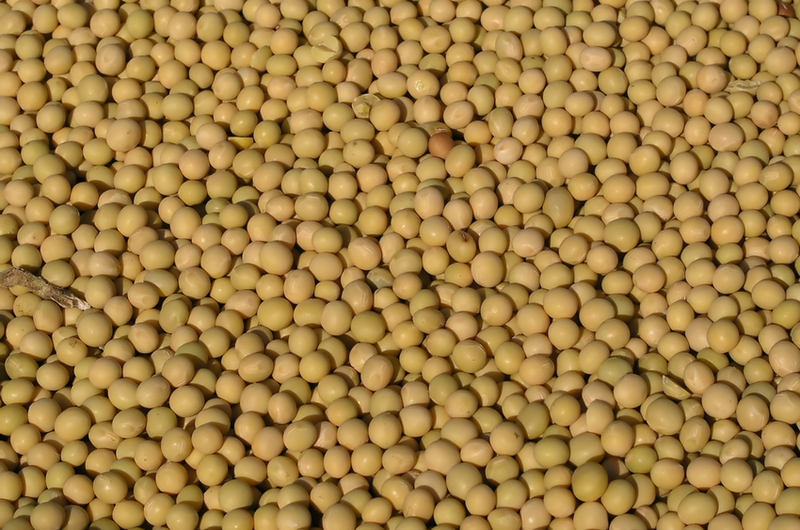 The seeds of soybeans occur in various sizes, and the seed coat (hull) in many colours, including black, brown, blue, yellow, green and mottled. The hull of the mature bean is hard and water-resistant. Soybean is widely grown around the world with the United States of America, Argentina, Brazil, China and India being the largest producers and representing more than 90% of global soybean production. The bean has a long history of production in China where it has been grown for over 5,000 years. In Australia, wild soybeans were discovered in north eastern Australia in 1770 by explorers Banks and Solander. In 1804, the first soyfood product, a sauce called “Fine India Soy” was sold in Sydney. In 1879, the first domesticated soybeans arrived in Australia, a gift of the Minister of the Interior Department of Japan. The Australian soybean industry is based on non-genetically modified varieties and is relatively small, complex and opportunity based, depending upon global commodity markets and weather conditions. However, it is a valuable summer rotation crop that can be used in dryland or irrigated farming systems and is grown in conjunction with cereals and sugarcane. 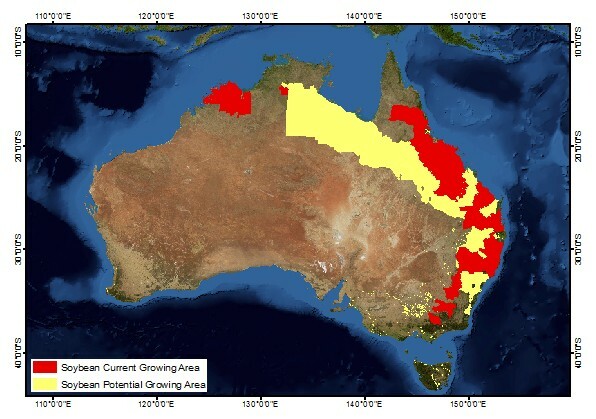 The growing regions for soybean in Australia are diverse and grow from the Atherton Tablelands in Queensland down to the irrigation areas of northern Victoria. There also is a small industry based in the Ord River region of Western Australia. Soybeans are best suited to climates with hot summers and they usually take 80–120 days from sowing to harvesting. They can grow in a wide range of soils, with optimum growth in moist alluvial soils with a good organic content. Soybeans, like most legumes, form a symbiotic relationship with the nitrogen-fixing bacteria of the genus Rhizobium to provide nitrogen to the growing plant. They also make an important contribution to the sustainability and profitability of farming systems as a rotation crop as they improve soil fertility and are used to provide a disease break. Historically, the Australian soybean industry has been based on the use of the bean for crushing for oil, however there is now growing interest in the potential use of soybeans for culinary purposes. These products include milk, tofu, flour, and edamame. The soybean industry in Australia is considered an established industry represented by Soy Australia. Soybeans are a valuable crop in rotations and add nitrogen to cropping systems through a symbiotic relationship with Rhizobium bacteria. Soybeans generally constitute about 60% of the world oilseed production and they are considered one of the most important agricultural commodities. The United States of America, Argentina, Brazil, China and India are the largest producers of soybeans and represent more than 90% of global soybean production. Of the average 260 million tonnes produced worldwide each year, about 10% is used directly for human foods, about 20% is extracted for oil and the remainder is used for livestock feeds. Australia is one of the smallest producers of soybeans in the world. Production of soybeans in Australia can be significantly affected by drought, and since about 2005, national production has fluctuated from 32,000 to over 100,000 tonnes from 14,000–56,000 hectares. Generally, the largest producing state is New South Wales and the smallest is Victoria. Australia is a net importer of soy-based products, primarily driven by demand for meal, and this is unlikely to change significantly in the short to medium term. The two main uses for soybeans are to produce oil and meal, or to provide edible quality beans for human consumption. Soybeans comprise approximately 80% meal and 20% oil, and are classified as a ‘low oil’ seed. There is also growing potential for the use of soybean oil for biodiesel applications. In Australia, the availability of varieties with improved seed quality and higher returns from the human consumption markets, has seen the end use move away from the oilseed sector since the mid-2000s. 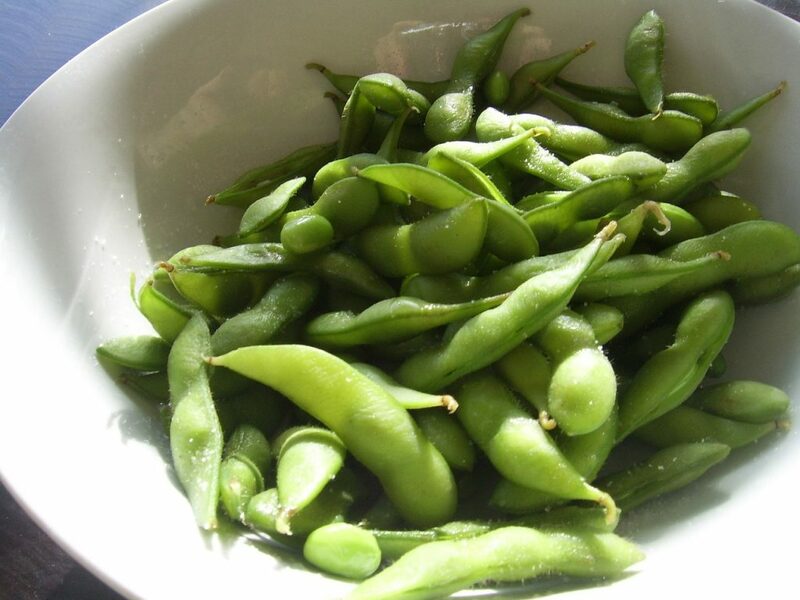 In the human consumption market, soybeans are consumed as soy milk, soy flour and various Asian soy products such as tofu, tempeh, soy cheese, edamame (immature beans steamed in the pods and served with salt) and soy products such as soy sauce. Soybeans have a high level of functionality in processing and are becoming popular in Western products such as bread, soy-based meat replacements, milk, margarines, soy snacks such as soy chips, nuts and protein bars. The rising consumption of these sorts of products is mainly due to the health promoting qualities or disease prevention benefits associated with soybeans. Soybeans play a valuable role in cropping rotations as they contribute to the soil nitrogen balance and can improve soil structure. They can also be used for grazing, and hay and silage production. Soybeans are often grown in sugarcane production systems as a green manure crop. 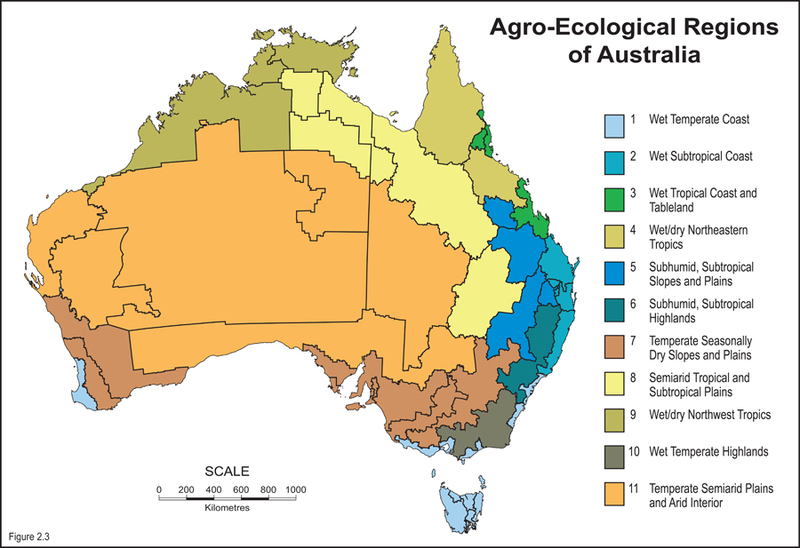 As soybean is a summer species, its production in Australia is suited to regions where the summer temperature is warm and the day length is longer. Soybeans are grown on the Atherton Tablelands in Queensland, in central and coastal Queensland and along the Queensland–New South Wales border. They are produced in the major inland irrigation areas of north western and central New South Wales; and in the irrigation areas of the Murrumbidgee and Murray rivers in southern New South Wales and northern Victoria. There is a small industry based in the Ord River region of Western Australia. Soybeans require a well-drained soil, as they have little tolerance to waterlogging in the early growth stages. 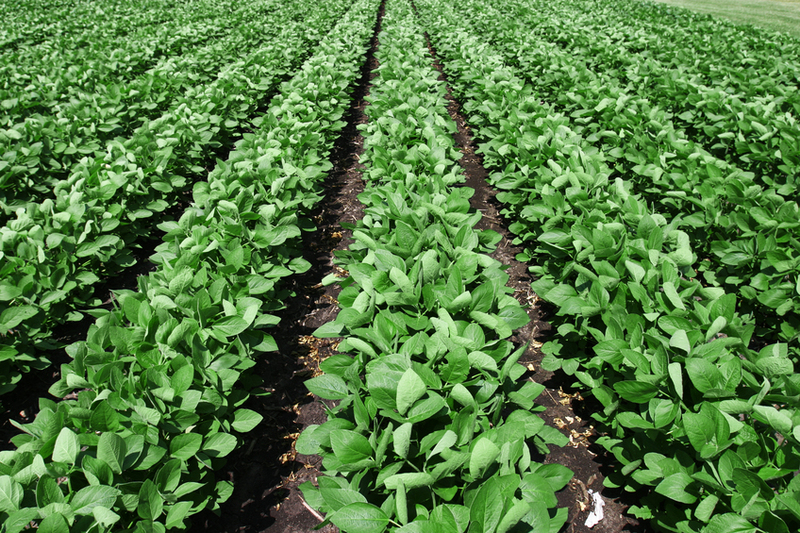 Plants grow best in sandy loam through to sandy clay textured soil, however, with good irrigation design, soybeans can be grown on medium to heavy clay soils as well. They prefer soil pH levels of 5.2–6.5 (CaCl2), and due to their sensitivity to soil acidity, soils with a pH less than 4.8 (CaCl2) may need liming before the crop is grown. Soybean is a summer plant species and therefore susceptible to frosts. It is very photoperiod sensitive, which means that flowering is triggered by decreasing day length after the summer solstice on 22 December. If soybeans are grown as a rain fed crop, they need to be produced in regions that have reliable summer rainfall of around 260mm in-crop. If grown under irrigation, high yielding crops require 6–8ML of irrigation water per hectare, but this will vary with soil type, soybean variety, paddock and irrigation layout and seasonal conditions. The ANSB has a number of key target regions for which it develops soybean varieties. The regions include the Riverina (NSW), the north coast (NSW), inland irrigation areas (NSW), sub-tropical coastal region (Qld) and the Darling Downs (Qld). Snowy, suited to southern NSW and northern Victoria and to irrigated production in the Riverina. Combines good yield with high culinary quality, it has a clear hilum. Bunya is a quick maturing variety suited to northern New South Wales and southern Queensland. It has a large seed size and has culinary quality. It is resistant to the two types of phytophthora root rot found in Queensland. Stuart is a long season type suited to tropical environments such as coastal and tropical Queensland. It has good resistance to nematodes and rust. Moonbi is a large seeded variety. It was bred for New South Wales north coast and inland irrigation areas. It finishes quite quickly which is an advantage in cereal growing areas to minimise the risk of heavy rain at harvest. Djakal is a large seeded, buff/brown hilum culinary type suited to the edamame market as well as animal feeds. Further information on soybean varieties appropriate for Australian growing conditions is available from the Australian Oilseeds Federation website and from New South Wales Department of Primary Industries Summer Crop Production Guide 2014. Soybean seed is very fragile and needs to be handled with care to avoid any damage to the seed coat. Spiral augers should be avoided with preference for belt shifters and vacuums. Soybean seeds are relatively short-lived and even when produced under optimum conditions can lose germination and vigour after a few months in storage. A germination test, therefore, should be carried out before a seeding rate is determined. Seeding rate needs to be adjusted according to seed size and germination percentage, and a desired plant density of 35 plants/m2 should be targeted. Soybeans have a large nitrogen demand but can obtain the majority of this from the atmosphere via Rhizobium bacteria forming nodules on their root systems. Prior to sowing, soybeans must be inoculated with the appropriate rhizobia group for soybeans (Group H) to ensure effective nitrogen fixation. The rhizobia prefer soils with a low nitrogen status. Soybeans have a large requirement for phosphorus and rates of 24–40kg/ha are recommended, depending on the soil type and cropping history. Time of sowing will vary according to variety and region, and growers should consult regional production guides or their local agronomists for advice on both choice of variety and appropriate sowing time. Dryland soybeans should be sown into a full profile of soil moisture (60–120cm wet soil depending on region). Irrigated soybean fields should be pre-irrigated and the total irrigation requirement will be about 6–8ML/ha. The soil temperature needs to be above 13°C for sowing, and the beans are usually sown at 5cm depth. Seedbed preparation will depend on the farming system and crop rotations but soybeans are versatile in that they can be sown with several different types of seed drills, into different types of seedbeds: no-till, minimal till and cultivated. Drilling of the seed provides superior establishment to broadcast seed, due to the relatively large seed size compared with other grains. Row cropping provides more alternatives for weed control. Row spacing and density will vary according to variety and region and expert advice should be sought. Soil moisture monitoring systems, such as tensiometers or capacitance probes, are recommended to estimate water requirements effectively and efficiently, especially in the later stages of growth. For further information on soybean planting and management, see the New South Wales Department of Primary Industry’s Summer Crop Production Guide 2014 and detailed soybean grower guides for Victoria, north coast New South Wales, inland New South Wales and Queensland which are available from the Australian Oilseeds Federation website. Soybeans are a very vigorous crop and compete with weeds if they can achieve full canopy cover quickly — this can be assisted through narrow sowing rows and early sowing. Herbicide recommendations for soybeans, pre-sowing and in-crop, can be obtained from regional grower guides available from the Australian Oilseeds Federation website. Information on registered chemicals including fungicides and insecticides for use in soybeans is available from the Australian Pesticides and Veterinary Medicines Authority (APVMA). There are a few fungal diseases that affect soybeans, but the major ones are: rust, charcoal rot, Sclerotinia stem rot, Phytophthora root rot and, powdery mildew. Rust is favoured by humid conditions and temperatures of 22-28⁰C that usually occur in coastal regions. Charcoal rot is caused by a soil-borne fungus and symptoms, wilting followed by plant death, usually appear between pod fill and maturity. Sclerotinia stem rot is favoured by extended periods of wetness at moderate temperatures (12-24⁰C). Phytophthora root rot is prevalent in wet and waterlogged conditions and is identified by brown or dead tissue leading up the stem from the ground. The fungus prevents uptake of water and results in plants wilting and dying. Powdery mildew is a fungus that infects leaves and, when severe, reduces leaf function resulting in significant yield losses. There are management strategies for all of these diseases. Soybeans are vulnerable to insect attack throughout their whole growing cycle. At early seedling stage they can be damaged by the grubs of common grass blue butterfly and soybean moth. At the pod formation stage they are susceptible to green mirid. Throughout their entire life cycle they can be affected by green vegetable bug, red banded shield bugs, brown stink bugs and silver lead whitefly. Helicoverpa grubs usually appear around mid to late pod-filling stage. Crops should be regularly swept and monitored for insects from emergence to maturity and an appropriate management practice implemented. Further information on weeds, pest and diseases and insects that may impact on soybean production are documented within the Department of Primary Industry’s Summer Crop Production Guide 2014 and soybean grower guides for Victoria, north coast New South Wales, inland New South Wales and Queensland are available from the Australian Oilseeds Federation website. grain silos — if soybeans are to be stored on farm for any period. Some or all of the operations required to produce a soybean crop can be carried out by contractors, which may alleviate some capital investment in the significant amount of plant required for crop production. Soybean is suited to a large range of irrigation layouts or systems: raised bed, furrow, flood or sprinkler (including lateral move) irrigation. Soybean seed should be harvested at 15% moisture content to minimise seed damage and should be stored at below 13°C, preferably at 10% moisture and kept cool to maintain viability. Correct header settings should be adhered to so as to reduce grain losses during harvest. Harvest is commonly carried out with an open front header set low to get the bottom pods on the crop. The concave should be open, drum speed low and wind high to minimise seed damage and maximise sample purity. Large seeded varieties such as Bunya need to be harvested with more care than smaller seeded varieties to avoid damage. In some regions, under normal seasonal conditions, harvest of soybeans takes place during the wetter part of the season. This can be detrimental to grain quality, limit paddock access for harvesting and increase insect damage. Harvesting should therefore take place in the driest part of the day. A dessicant herbicide may be used to mature the crop evenly. Harvested grain is sold without any further processing on farm, to agents who clean, grade and accumulate the grain for on-selling; or the grain may be sold directly to a processor. Alternatively, the grower may store grain until prices are favourable or according to contract conditions. There are two broad markets for soybeans, crushing for oil and meal or beans for human consumption, and growers need to identify which market they wish to produce for before they plant as the decision will influence variety choice. A detailed marketing guide that lists purchasers of Australian soybeans is available from the Soy Australia website. Soybeans are manufactured into of a wide range of products for human consumption which include soy flour, soy milk, soy grits, tofu, tempeh, spreads, soup, confectionery and other Asian foods. Human consumption markets generally prefer beans with good seed size (20–24g/100 seeds), high protein and high germination percentages. Beans should be free from stains, soil, moulds and damage to the seed coat. There is very low tolerance for admixture and dark hilum seeds. Seed grading is normally required. The largest domestic market is for soy flour, which requires about 20,000 tonnes of soybeans per year, followed by soy milk which uses about 10,000 tonnes per year. The consumption of soybean meal by intensive livestock feeding in Australia (e.g. feedlots) is growing rapidly. Historically the major export markets for Australian soybeans have been Korea, Taiwan, Malaysia and Papua New Guinea. There are no genetically modified soybeans grown in Australia and this benefits high value export culinary markets into Japan, Korea and Taiwan. The Australian Oilseeds Federation publishes marketing and trading specifications for crushing and edible soybeans which is made available by Grain Trade Australia. Grain Trade Australia has a producer package available for purchase which provides access to standards, contracts and dispute resolution. not recouping the costs of inputs and capital invested in the crop, like fertiliser or the cost of running large equipment if the crop fails. One of the biggest challenges for irrigated soybean growers is the availability and pricing of water. As soybeans require a significant amount of both pre-sowing and in-crop water, the cost-efficient provision and efficient use of irrigation water is imperative. The selling price for soybeans is also a challenge. The Australian soybean crop price is based on the world commodity price for oilseed crush grade soybeans and edible types can receive a premium of AU$50–100 on this price. Growers have to consider producing soybeans in relation to comparative returns from other crops such as cotton, rice, sugar and other pulse crops. There is a lack of handling and storage infrastructure for soybeans in Australia, particularly in central and northern regions of Queensland. Freight costs to southern markets can be prohibitive to production in these regions and it is partly for this reason that some Queensland growers use soybeans as a green manure crop and do not take them through to harvest. The development of a number of small, regional processing plants that supply local feedstock demand, has alleviated some of the freight cost problems and improved grower returns in those regions. Apart from the regulatory considerations that apply to all Australian grain farms, including laws applying to chemical use and management, occupational health and safety and transport (including machinery movements and the loading/unloading of harvested grain), there are no regulations that are specific to soybean enterprises. More information about laws and regulations affecting soybean growers (and grain growers generally) can be obtained from the relevant government authority. Information and advice can also be sought from the relevant state farming organisation, some of which are listed on the National Farmers’ Federation website or Grain Producers Australia. Grains and Legumes Nutrition Council the Australian independent authority on the nutrition and health benefits of grains and legumes.